Which is a better reel to use: a spinning reel or a baitcasting reel? This is a question hotly debated within the fishing community. It seems like everyone has their own strong opinions, and it might be difficult to wade through all the arguing to get to a straight answer. 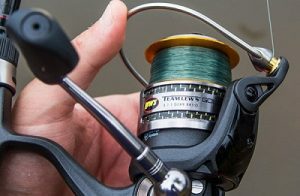 Whether you’re a new fisherman trying to find the right way to start, or an experienced angler looking for a new perspective, this article will help you choose the right type of reel for you. First, let’s look at the two different reel types. Spinning reels, also called open-faced or fixed spool reels, are one of the most popular reel types around. They are mounted underneath the rod, allowing gravity to place it in the perfect resting position with minimal effort in the wrist to maintain its positioning. The rod is cast with the right hand, meaning that the bail can easily be operated with the left hand. The line is released in coils, reducing the likelihood of tangling. This style of reel was originally developed to accommodate baits that are light in weight, such as artificial flies, which were too difficult to use with heavier baitcasting reels. These early versions of the spinning reels were the preferred choice for catching trout or salmon. Recent improvements to spinning reel designs make them suitable for catching a wider variety of fish today. Baitcasting reels are also known as revolving-spool or overhead reels. They have an unusual mounting position: they rest on top of the rod, unlike most reels. When casting, the fisherman uses his thumb, usually by pressing down on a button or bar, to control the amount of line that is unspooled. Baitcasting reels are powered with multiple gears, meaning that one revolution of the hand-powered crank will result in multiple revolutions of the spool. This allows for a much greater amount of power when reeling in, perfect for catching bigger fish that will put up a greater fight. Spinning reels are great for the beginner angler. Casting and reeling in is simple enough that almost anyone can learn how to use a spinning rod in a relatively short amount of time. They are easy to use and are quite versatile, handling a wide array of different types of line, lures, and bait. Spinning reels can be outfitted with almost anything in your tackle box, but they especially excel with lighter lines and lures; you won’t have to worry as much about tangling your line when casting light gear across far distances or into the wind. The focus on lighter equipment makes the spinning reel great for catching small to medium-sized fish. A spinning reel is also easier to side cast, which is useful if you’re restricted by tight quarters, such as under low-hanging tree branches. The side cast allows for easier maneuverability to avoid branches or bushses.This technique, combined with the ease to cast spinning line out further, makes it perfect for shoreline fishing. The downside of the spinning reel is that it is more difficult to use heavier lines and tackle with it. A spinning reel has a narrower spool which makes it more difficult to use a large diameter line, and lacks the power a baitcaster has to accommodate heavy weights without much difficulty. Spinning reels are also less accurate unless handled by an experienced fisherman. It may take several casts to find the perfect amount of line to use to land your bait where you want it. In contrast, baitcasting reels are often lauded for their accuracy. The amount of line can be controlled mid-cast with just a touch of a button. The button on a baitcasting reel can be pressed down with your thumb, which stops the line unreeling when you want. Such a set up means you can watch your line as you’re casting and judge where you want it to fall, and prevent overcasting. You should be able to easily avoid getting your lure lost in bushes or lily pads as a result. The real draw to the baitcaster reel is its strength and backbone. Baitcasting reels are more heavy duty, and can handle heavier line and lures. Baitcasting reels also often have larger double-knobbed handles, meaning you can really crank down hard on it when fighting with a strong fish. Since baitcasters are more durable and heavy duty, they are essential to use when fishing for large fish, such as pike and catfish. However, baitcasting reels are not the best choice for the beginner. They require a lot of practice and skill in order to cast them right. Some more experienced anglers enjoy the difficulty of casting a baitcaster, finding them more fun to use. However, newcomers may feel frustrated at their inability to get their line out just right. 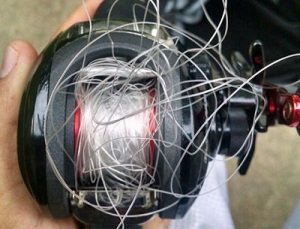 The biggest drawback of baitcasting reels is the dreaded backlash, sometimes called a “bird’s nest” or “rat’s nest.” This occurs when the bait hits the water and stops, but the line continues to come unspooled. As a result, you’ll get yourself a tangled mess in your reel, which is very difficult and time consuming to deal with. This can be avoided with some practice and knowledge of when exactly to stop your line, but even experienced fishermen will have to deal with backlash occasionally. So to answer the age-old question of which type of reel is best, the response is: it depends. Each one has its place, depending on what you are trying to catch, your skill level, and personal preference. Spinning reels are great for a beginner, easy to use, and quite versatile. If you’re new to the hobby, you might want to start out on one of these. Baitcasters, on the other hand, require a little more skill to use, but the power behind them will really let you catch a monster of a fish. The important thing is to experiment, and find something that will really suit your own personal fishing style. It is important factor to choose good quality baitcasting reel. You have share very very important factor of baitcasting reel. which will be help us choose one of the best quality baitcasting reel. Thanks for sharing this great method.